Free Trial Comes to an End... Now it's a Paid Trial! Square-Enix just announced that they will start billing for Final Fantasy XIV starting January 6th, 2012. This is one full year before they expect to launch the 2.0 client and basically re-do most of the game, in 2013. So, despite all the troubles with the game so far, now they want you to pay for it before they fix it. As if buying the box wasn't bad enough. The prices are pretty rotten too. $10 a month for 1 character, $3 a month more per alt. I dunno, as much as alts aren't needed in FFXIV, charging per character isn't something I like to see. At least not in a subscription game; sure, charge me extra character slot after the first two in a F2P title, but charge me a $7 subscription and give me no characters at all? Are you mad? FFXIV's original problems seemed to stem from a disconnect with gamers, with the community, and with reality in general. With the change in leadership a year ago, things looked like they were going to change: two big surveys, official forums, the whole reaching out business. But that sure dried up fast. Where was the survey asking players if they wanted to pay for a year before the main fixes were implemented? Asking players if they want to have to pay per character? The disconnect is just as jarring now as it was back then. The Fate of FFXIV: Can it be saved? There's been quite the discussion about whether or not Final Fantasy XIV can recover from its poor launch and poor first year over on Eorzeapedia, an FFXIV fansite I like to follow. The thread's getting a little long, but it's still a good read: there are a lot of insightful posts from a lot of enthusiastic fans. If FFXIV does fail, it won't be because of a lack of support by the people who love the franchise or the previous MMO, FFXI. For my part, I'm not sure if the game can come back. Although I'd like to remain cautiously optimistic, I have to keep in mind how much I disliked Final Fantasy XII and XIII. Then again, I disliked those because of AI control of party members, something that doesn't happen at all in a single-character MMORPG. Final Fantasy XIV's problems are a different kettle of fish: rather than one poignant issue that breaks the game, its instead riddled with little issues all around. You could fix this easily by remembering what frame of the song you were on when you toggle, so you can resume the previous song as you go back and forth. You could also extend the combat music after the foe was slain if the player stays in combat mode and attacks another enemy within 10-20 seconds. I haven't had a chance to use a classy journalistic title in a while, but it seemed this news deserved it. I found out both in email and via Lodestone: Hiromichi Tanaka is stepping down from the lead producer role in Final Fantasy XIV and Naoki Yoshida will be taking over. A bunch of other positions may or may not have been changed. Along with this shift, the free trial will be continued until further notice and the PS3 release has been delayed past March 2011. The first think that popped into my mind was: how long will it be delayed? Obviously, they want to fix up FFXIV before releasing the PS3 version, but I thought that the game could be more-or-less fixed into a playable format before March. If the PS3 version is delayed, that means it'll take more than 3 months to make the game viable, which means at least 3 more months of free trial but at least 3 more months of poor-quality agony. It would be my guess that, at this point, Square Enix just wants to take dates off the table and focus on making the game work well. As far as what changes we'll see with this new direction, that's a whole other kettle of fish. I'm still arguing strongly in favour of replacing the Market Wards with a proper Marketplace system, as I've argued in my Gamasutra Article on MMORPG Economies. I'd also like to see changes in other parts of the game... but I haven't really spent a lot of time developing those ideas yet. One of my biggest fears, conversely, is that the game gets oversimplified. In EQ2, backlash against the complex crafting system caused it to be reduced to an extremely simple and banal mechanic; I'd hate to see FFXIV's rich and diverse economic backbone be trashed in the attempt to fix the game. In any case, more updates as they come. I'll see if I can get a few questions out to Naoki, but with the holidays fast approaching and the chaos no doubt surrounding the new changes, I'm not getting my hopes up. First FFXIV Tour! Woo hoo! As my loyal readers know, I'm a fan of the in-game tours put on by Square Enix and have enjoyed the exclusive glimpses of Vana'diel over the years. Well, there's a new game in town and that means a whole new world to tour: Eorzean tours have begun! The fun and friendly team at Square Enix were happy to show me some of the cooler higher-level content around Gridania, and it's my pleasure to share my experiences with you. When I logged in, it was like being a kid in a candy shop: my tour character was helpfully set to level 50 in every single class. I couldn't help myself, I had to grab a weathered head knife and a level 50 crafting leve and give it a whirl! I botched my second attempt... seems that even with level 50 you need a good crafting tool. But I'm going way off piece with that, aren't I? We did do some crafting together. They handed me a rank 42 hammer and some components so I could make myself a Calvary Haubergeon for the rest of the tour. I do love crafting... but I couldn't get an HQ! Shucks! Still, looks quite spiffy. I was curious though, since they had me set up as Pugilist and the armor doesn't favor PUG. Did that make a big difference? They said there wasn't a notable reduction for not being a favored class. Mmm. I just wanna start by saying: "I so called it." Final Fantasy XIV is getting another free trial extension, bringing the total free time from an original 30 days to 90 days. It was absolutely necessary, as the earliest core adopters of the game (those that bought the collectors edition) would have had their accounts expire November 20th, long before any of the much described fixes would have been released. So now that there's 30 more days, what's Square Enix going to do with them? For starters, they could read my recent article: Virtual Economic Theory: How MMOs Really Work on Gamasutra. The final part of that article is a case study of Final Fantasy XIV's economy. One thing I didn't get to touch on in my article, because it wasn't revealed until after I sent it for publication, was that Square Enix has suggested removing +1 and +2 loot items to improve inventory management. Personally, I think this is a bad idea. I think the full range of items (+0 through +3) adds a great dynamic to the game. What really needs to be done is a chance to the inventory system that allows all four qualities of items to reside in the same inventory slot. This, and vastly increased stack sizes on arrows (999 a stack please) with similar increases in production (320 arrows a synth rather than 32). There's another issue that needs to be addressed: bots. I've never seen so many bots in an MMO before. Maybe I've just lived a sheltered life: I saw a bot once before in DAoC but the GM came and dealt with it minutes after I reported it. Not so in FFXIV. A bot logged in and camped right ontop of me and, despite three reports, he was still there harassing me an hour later when I gave up and moved on. Square Enix has just announced that they plan on extending the initial free month for Final Fantasy XIV subscribers for another month, as a response to the feedback from players. This is definitely a good move and will certainly put a kink in the gears of all those "we're all canceling in protest" plans that would have left Eorzea empty on October 21st. Square Enix also directly addressed many of the concerns players have, acknowledging the issues and promising to fix them. The fixes are wide-ranging and cover most of the issues that have been brought up by both players and reviewers. They plan adjustments to the user interface, which many players (probably those who didn't play FFXI) have issues with. They're also going to be balancing and fleshing out the game, especially in regards to party-based play. Adding a shortcut for replies, adding position info to maps and chat, making it possible to target party members from the party list... the list is fairly comprehensive. With one glaring omission: they're not scrapping the Market Ward system. This is it folks: the moment you've all been waiting for. 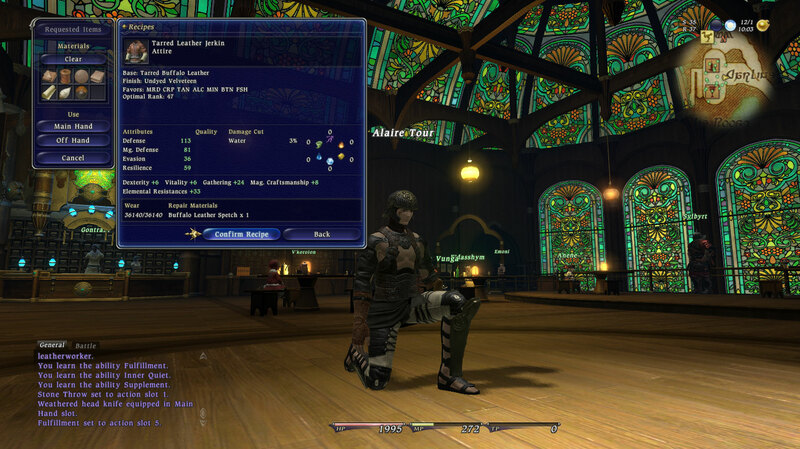 A full review of Final Fantasy XIV. Here's the TLDR: there are enough fatal flaws to justify pulling the plug and sending it back to the drawing board. However, these flaws are sufficiently constrained that a concerted repair effort could save this from being another Tabula Rasa. With that dire forecast out of the way, lets start off with what I like. I like the music. I'm going to start with this because, ever since Final Fantasy 7, I have been able to determine whether or not I'd like playing a FF game just by listening to its soundtrack. I listened to the FF8 soundtrack before I played the game, loved it, and sure enough, loved the game. FF9's soundtrack didn't do it for me, and I never got into the game. Same with 10. 11, thumbs up (especially love the airship tune), and the game had me hooked for years. 12? Not so much, and the game reflected it. 13? Really not doing it for me. 14? Well now, as the game in question: I loved the soundtrack. The music is great. It's varied. The themes are strong and not at all repetitive. Everywhere you go, you hear that place's music and it feels so appropriate. My only gripe is that, even with the volume slider at max, music is noticeably quieter than the game sounds. Fix please! Graphics are nice. I've mentioned previously how much I liked the character emotes and animations. There's a few extra emotes I'd like to see in the game, especially a brandish animation to show off your weapon or tool. Anyhow, the huge open vistas of Thanalan and La Noscea are amazing, especially when you see the capital city of Ul'dah or Limsa Lominsa in the distance. Gridania and the Black Shroud, conversely, are bland, repetitive, and not in the least bit interesting to look at, mainly because you're running around in a maze of valleys and not able to see much of anything. Bleh! Cutscenes and story are very good, though I haven't had a chance to see many yet. The Ul'dah story is my favorite of the three opening ones, and I'm enjoying parts 2 and 3 there too (I'll only ever see one city's story, sadly). The cinematic moment when the maddened Gobbue crashes into the wall and the flower petals scatter into the sky, then it goes slo-mo and plays the theme song... Major thumbs up. The few parts where characters have voice acting is very good, though I'm disappointed at how little voice acting there is in the game, especially when other MMOs (see Star Wars: Old Republic) are claiming to have 100% voiceovers. I would much rather hear Thancred toss wild accusations at Ul'dah's elite society members than read the (well-written) text on the screen!